Are you a person who makes sure to have all your proverbial ducks in a row, everything meticulously planned out before you engage in a project, make your goals a reality, or depart on a trip? Or rather, are you someone who goes wherever the winds take you, your curiosity and openness to the unexpected prompting you to create things, to reap the rewards of a dream attained, or to traverse the globe? Are you a mapper or a rambler? While listening to Ted, I thought about whether I was a mapper or a rambler. “Certainly the former,” I said to myself. 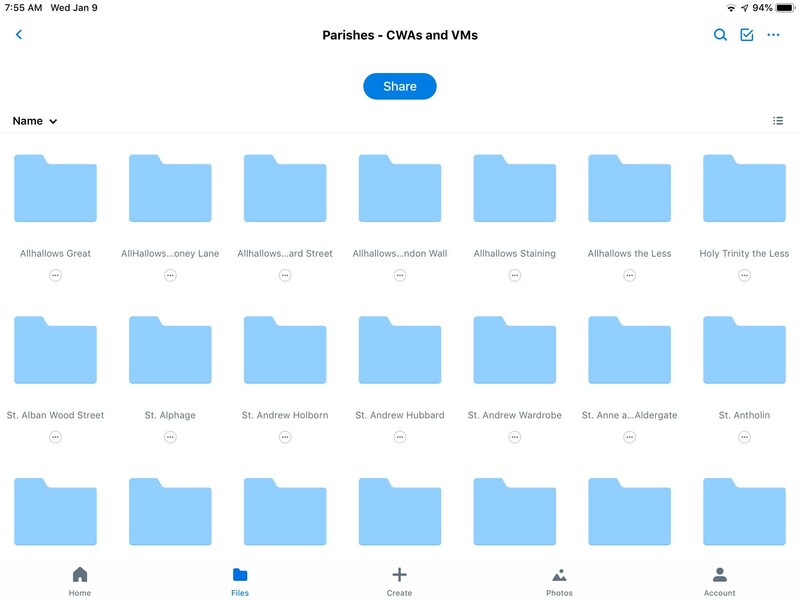 “Just look at how organized you are with your daily research diary, your notes, and all of your research and teaching materials kept on your Dropbox.” But the more I ruminated the more I realized that this had not always been the case. Indeed, as a graduate student studying Tudor-Stuart history, I was the guy who commonly stayed up until 3 am, reading monographs, analyzing primary sources, and writing articles and my dissertation in the wee hours, largely allowing the research and questions lead me in whatever direction they took me. Opened books and scattered papers commonly accumulated on my office floor, mountains of scholarly pursuit born from a rambler. Yet over the subsequent years I have largely abandoned these rambling ways. As a mapper, I spent the preceding months to my arrival at the Folger painstakingly creating lists of sources—many titles of rare books—housed at the library, intending to be efficient, chronological, and sequential as I diligently engaged with the materials. Common sense told me that this was the best approach for my project while on fellowship—researching mass ejections of clergy from England’s parish livings between 1642 and 1662, a phenomenon resulting from the political, religious, and cultural tumults of the English Civil Wars, the Interregnum, and the Restoration. My examination of these clerical purges revolves around how they manifested in London, and my hope is that furthering our understanding of the ejections will produce new insights on the interplay between state and local politics, the importance of polemics to mobilize support in the public sphere, and the key deployment of the language of martyrdom both in these polemics and in the memory of the removals. Overall, the scholarly endeavor is large and can potentially become unwieldy—both logistically and intellectually—because of the enormous amount of sources related to the topic. Hence, the need for mapping prior to and upon arrival at the Folger last August. I immediately began reading sources relevant to the clerical ejections in the library’s rare materials collection that I had identified earlier in the summer, particularly those produced by episcopalian or Anglican clergy sequestered from their London benefices. In the midst of this early research, however, I realized that in order to properly read these books within their context, I needed a firmer grasp of the early manifestations of Anglicanism as a denominational belief and identity, something for which historians have identified the 1640s and 1650s as crucial in producing. One such scholar is Kenneth Fincham, and I spent a few days consulting his work on the subject. Mind you, this had not been my intention before arrival at the Folger. 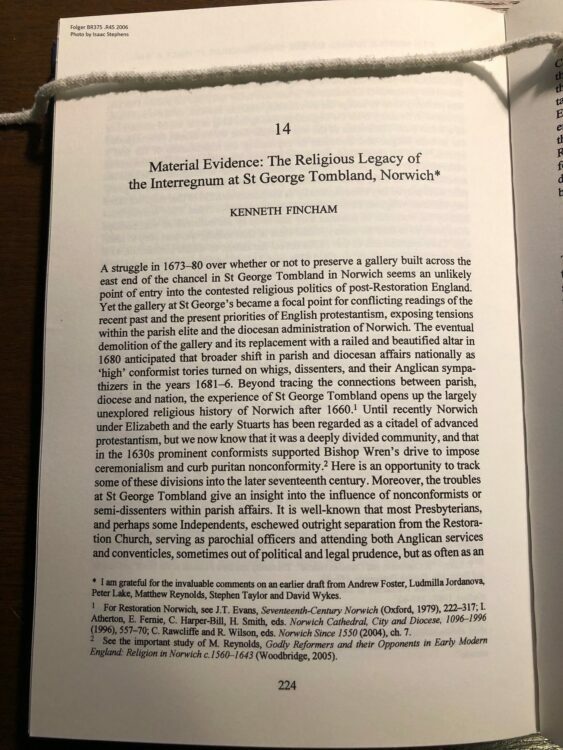 First page of Fincham’s “Material Evidence: The Religious Legacy of the Interregnum at St George Tombland, Norwich” in Religious Politics in Post-Reformation England. What really caught my eye in the article was the appearance and role of Edward Reynolds, Bishop of Norwich (1660-76), who was the only Presbyterian to accept a bishopric in the Church of England from Charles II, the son of the executed Charles I whose regicide ushered in the Interregnum after the English Civil Wars. Before the wars, Reynolds held a living in Northamptonshire as a parish minister, and he belonged among what historians commonly refer to as moderate Puritans, a godly group devoted to Calvinism and an austere piety centered on Scripture but who also proved accommodating, if not sometimes indifferent, to religious beliefs in discordance to theirs. I had long known about Reynolds, and even considered, though not very seriously, researching and publishing on him. Scholarly rambling transformed such whimsical thinking. In Fincham’s article I noticed a reference continually cited in his footnotes—“FSL V.b.305.” Curious, I consulted an abbreviation list at the front of the collection of essays in which the article appears and learned that FSL stands for Folger Shakespeare Library! Immediately consulting the library’s electronic catalog, I discovered that “V.b.305” was the call number for a volume of manuscript correspondence consisting of forty letters sent to Sir Robert Southwell (1635-1702), a clerk to Charles II’s privy council.4 The chief correspondent in the letters was Dr. Owen Hughes, episcopal commissary to the Bishop of Norwich and Norfolk archdeaconries in the early 1670s. All of this was news to me, as I had been unaware of “V.b.305” because it lacked direct relation to my project on ejected clergy. 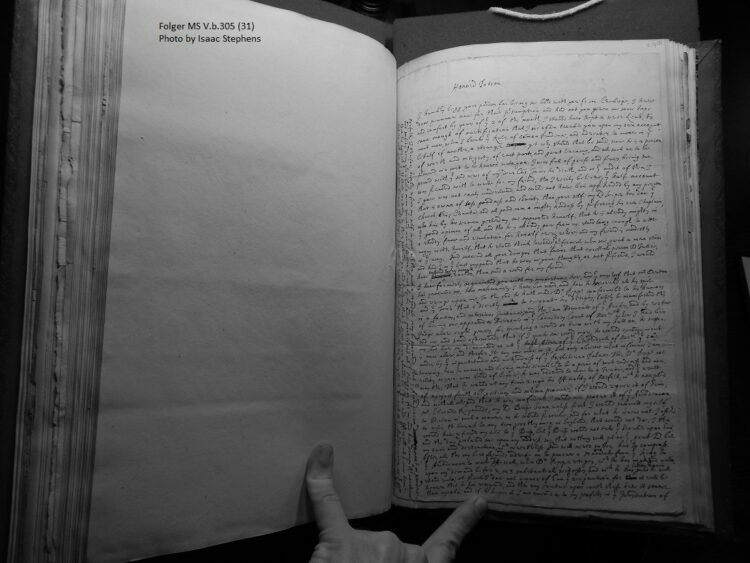 Nevertheless, I continued to ramble, calling up the letters in the Folger’s reading room and subsequently viewed first-hand evidence of Reynolds’ protection and promotion of Dissenters in his diocese, to Hughes’ chagrin. Describing the prelate’s domicile as the “Presbyterian Palace,” Hughes depicted Reynolds as a protector of seditious and zealous “phanaticks” [sic], making Norwich a hotbed of nonconformity that was a danger to both the English state and church. At least in Hughes’ case, Reynolds’ principled moderation clearly rubbed the persecutory spirit of the early modern period raw. 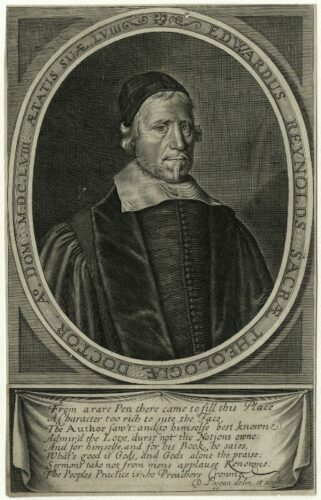 My reading of “V.b.305” led me to search for the overall source base on Reynolds that exists in the world, and I learned that he published extensively throughout his life (the Folger holds a number of these works) and that there are copious Church records in England that help contextualize his writings. Rambling in the Folger has convinced me to write a book on Reynolds someday, but my mapping still continues as I make solid progress on understanding seventeenth-century clerical purges in London, work vital to also composing a monograph on this subject. So, what am I—a mapper or a rambler? Thanks to the Folger, I’ve accepted that I’m a bit of both, and I’d bet my bottom dollar that the library has played, and will continue to play, a similar role in past and future scholarly endeavors. In other words, may the Folger Shakespeare Library help all the mappers and ramblers out there like it did for me. Isaac Stephens is Assistant Professor of History at the University of Mississippi, and is a NEH Long-Term Fellow at the Folger this academic year (2018-19). His work centers on early modern British history, and he has a particular interest in the interplay between religion, politics, gender, and culture during the Stuart period. This post is enlightening, creative and fascinating to read. I hope Dr. Stephens writes that book.